BHU PRT TGT Computer Operator Clerk Exam Admit Card 2019: University will publish the admit card at least one week before the date of commencement of written exam on its official portal. BHU PRT, TGT, Clerk, etc. recruitment exam admit card is going to be issued soon to the registered candidates. For information about the exam and admit card availability dates, candidates are advised to regularly visit BHU official website and also this page. In the given article, we have tried providing all the necessary information related to BHU PRT, TGT, Clerk, etc. 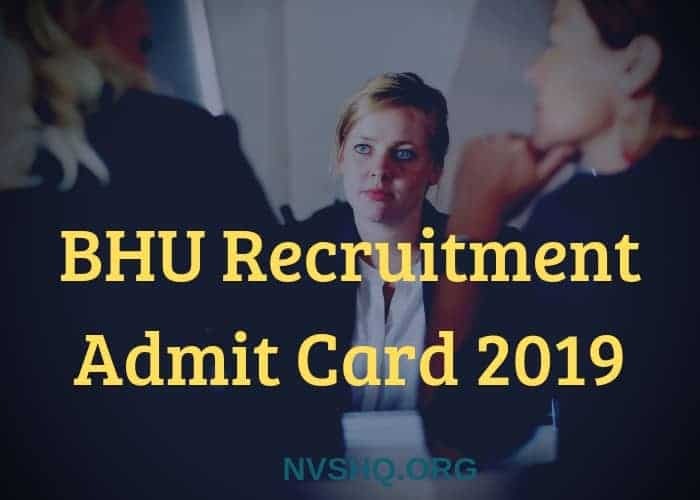 recruitment admit card. Here, applicants will get information about the admit card availability dates, online process for downloading online admit card, information printed on it, etc. 2 How to download BHU Recruitment Admit card? Through this recruitment process, suitable candidates will be selected for filling vacant seats in various departments of the university. BHU invited application for 1305 vacancies in Group A, B and C posts in different university departments. Selection for these posts will be made on the basis of merit in written examination. Those who will be shortlisted in the written examination will invited for document verification. For some of the posts, BHU may also conduct an aptitude or skill test after the written examination. The details and notification regarding the issue of admit card and examination shall be provided on the university portal. This is the reason we always advise candidates to stay in touch with the official website so that they could not miss even a single update regarding exams. The BHU admit will be published online as no other medium will be applicable. University will not send printed copy of the admit cards individually to any candidate. They are required to download it online by using the valid search credentials such as roll no., registration no. etc. The hall ticket will indicate the exam date, exam center along with other important information. The exam schedule and venue mentioned on the hall ticket shall be final. No request for change in exam date or center will be accepted under any circumstance. After taking printout of the admit card, examinees should read all the instructions mentioned on it carefully. They must follow the instructions during the exam, failing to comply with the same may lead to the cancellation their candidature from the selection process. It is compulsory for the candidates appearing in the written exam to carry a hard copy of the admit card to the exam venue on exam day. The invigilating officials at the examination center will not allow any candidate to write the exam who will be found without a valid hall ticket. Therefore, examinees must ensure that they carry their admission letter with them before leaving the house for exam and at exam premises on examination day. How to download BHU Recruitment Admit card? Start by visiting the official website of BHU (http://www.bhu.ac.in/rac/). On the homepage, select the relevant admit card link. Admit card download page will appear. Enter the login credentials to generate hall ticket. They can either generate it by providing Application form number or email Id. After providing the details click on “Download admit card” option. Read and verify all the details properly. Download and take multiple printout of the same. Admit card no./ Hall ticket No. Candidates must verify the details and information printed on the admit card before going to appear for the written exam. However, details expect the exam schedule and venue printed on the admit card are as per the information furnished in the application form by the applicants. In case of grievance, they should immediately take it to the notice of concerned officials. BHU will issue the admit cards to the registered candidates through its official website on notified dates. No physical copy of the admit card will be dispatched to any candidate by post. It can be generated by providing application number or email Id. All the candidates have to carry the valid copy of admit card with them to the exam center. Without this, no candidates will be given permission to write the exam.